Do you have a thing for the 1960’s? Do you wish there were more Mad Men era shows but where the woman is not the supporting cast in the first season? Well from Amy Sherman Palladino, yes, as in Gilmore Girls, is one the most fantastical TV shows to date. The story builds on a woman who is mastering the life of wife, home keeper and daughter but feels empty when it comes to having a passion or reason. Her love and dedication to her husband is not just in keeping his home and family but his lack luster career as wanna-be standup comic. Set in the era of comedic legends like Bob Newhart and Lenny Bruce (a key character in the show), this show gets behind the greats and breaks away the hidden world and history of female comics. The true reason you need to watch this show, is due to the pure genius of Amy Sherman Palladino and her team mastered in creating this show. From her amazing & signature writing and quick whit. To the amazing cast of fairly unknown actors who are sparking their stars brighter than ever before. Paladino’s hit with Lauren Graham and Alexis Blidel in Gilmore Girls became legendary. It also introduced the brilliance of Melissa McCarthy. Some had reservations of Sutton Foster in Bunheads but it’s another amazing show that really didn’t get a chance. I personal was obsessed with this show. Mrs. Maisel’s just took Palladino to a whole new level. It’s star and namesake, Rachel Brosnahan has found one of the most iconic roles of her career and that of television. Brosnahan might be familiar from her roles in the House of Cards and Manhattan. This role just screams perfection for her craft. Fair warning, once you watch that first episode, you’re going to get hooked like a junky! The show moves really fast over 8 episodes but I am happy report, season 2 is already in the can and in post-production. The new season will open in Paris (sorry spoiler) and there will be 10 episodes instead of season ones 8 episodes. There has also been comments from Palladino about bringing Gillmore alum Lauren Graham as a guest star. As of right now, there is no office drop date for season 2 but happy to report that Amazon has already secure a season 3 for the show. One last thing to note about this show and it’s amazing cast. If you are not familiar with the amazing Alex Borstein then you’ve been sleep at the helm of your television. 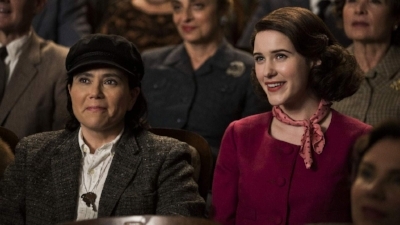 Borstein plays a down and scrappy bar manager/wanna-be-agent in the show and between her character and Mrs. Maisel, you are rooting for the under-dog while obsessed about all the little mistakes they make. Borstein made her start in hollywood as a voice actor on Family Guy but became one of few shinning beacons the early years of MadTV. Miss Swan is still one of my top 5 characters from the show. Borstein kills it yet again as Susie Meyerson on Mrs. Masel’s. Borstein almost steals the show from Brosnahan but by the end of season one, the two are like a well oil machine that is going to blow us out of the water when season 2 drop. Both Borstein and Brosnahan are up for Prime-time Emmy’s.